That is actually the name of a Blenderhead song, but not what this post is about. I just thought it made a cool title, and is half-way relevant. Due the release of Jeremy Enigk's 3rd solo album, 'OK Bear' and the news of the Sunny Day Real Estate reunion, I have been listening to lots of his music. Today that is the Fire Theft. Of the eight albums that Jeremy sings lead on, it is my least favorite. That is not to say it is bad, it just doesn't grab me the way the rest of his solo stuff and SDRE does. There are some outstanding songs on it, mainly "It's Over" and "Heaven." This post is about the song "Heaven." Heaven, both the song and the place, are two things I have never really understood, but I have had lots of thoughts about recently. And my thoughts about the place Heaven and the song "Heaven" parallel one another. Heaven is described by most people as a physical place- where we have big mansions on gold streets, we hang out with angels, and oh yeah God is up there with us to. It has taken me 32 years to completely grasp this, but heaven is not a physical place. Do I believe it exists? Definitely. But heaven is being with God, period. Will I live in a fancy place? Maybe. But the point of heaven, and the point of salvation through Jesus, is that I get to BE WITH God eternally. That is awesome. I get to worship him, spend time with him, and all the rest will be nice but not really that important. 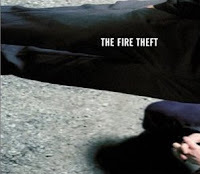 That brings me back to this song by the Fire Theft, with lyrics by Jeremy Enigk. I'll don't know what Jeremy was thinking when he wrote this song, but for the first time in six years, today it means something to me. You can't find heaven the place; you'll reach heaven when you fall in love with Jesus. can't find the road that gets through"